Sensible Soccer is one of those franchises that of late has been somewhere deep in the jungle with it’s head in the quicksand, competing for shelf space alongside Fifa and others that have dominated the landscape for some time. 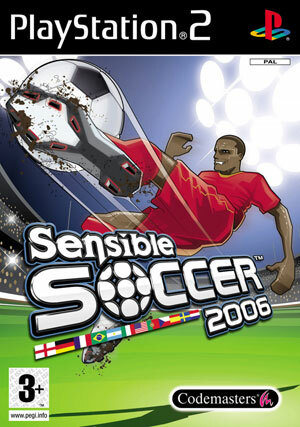 SS was one of the first titles that really had gamers enthused about soccer whether they were fanatics or not. Come around to 2006 and the news is out that the new game is being created by the original designer John Hare. Without the official blessing of Fifa, the roster does roughly cover the European league, but with name changes and slight appearance differences like oversized melon heads! The title is incredibly easy to get into with a really small learning time to get the hang of the game. The focus is on fast gameplay and within about 20 minutes you should have established a fair degree of control over the ball. There are a number of kicks that can be performed with varying degrees of difficulty involved in making them work effectively. 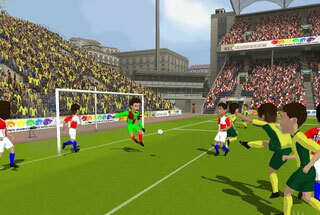 The game itself is fairly solid but does not offer that much new material to the soccer genre. One of my main bugbears in the game is that in a rather old fashioned approach, the game determines which player you can control instead of you selecting them. So essentially what happened was times where the moves being made didn’t make sense or the game let you use the best player for a particular role. Sensible Soccer does offer multiplayer support with up to four players duking it out on the field. It’s possible to effectively negotiate the gaming arena, dribbling the ball along for glory hounds, however be aware that you had best be sharp or the games AI will soon sort you out in short order. Possibly the real letdown with this game is the absence of any quality audio. There was nothing to get the blood pumping during a game. Hokey sounds are par for the course and detract from any fun a “serious” fan of soccer might have who expects that commentary will be there from known names in the world game. Best techniques involves a lot of passing of the ball and curling it with long passes toward goal. Curling can be undertaken with the sticks and you can really make some insane shots at goal that challenge belief. At the end of the day what you end up with is a game that is fun to play, although slightly flawed that doesn’t bring a great deal of innovation to a sport that already has some brilliant examples available on this console. That said, in some ways I actually prefer Sensible Soccer 2006 for the simple fact that it was easy to pick up and play, easy to get mates to play and enjoyable for how cheesy the look of the game was and its efforts to make the players, bobble heads and all, look like the real life counterparts they were imitating. Give it a rent for yourself and see what you think.